In their last game, South African side turned out to be victorious and defeated the world champions by 47 runs on 7th June. Though Australia successfully restricted RSA to 189 runs in 50 overs and didn’t let them score more, they failed to win that match. The opener batsman Aaron Finch contributed the most to Australia’s total. He scored the highest 72 from the team. He alone made more than half of the team’s total. Till now, in the series, the Aussies batsmen Glenn Maxwell and skipper Steve Smith haven’t found their proper form yet. Mitchell Starc, one of the pace bowlers of Australia will return in this game. He will replace Nathan Coulter-Nile. Starc was given rest in the previous match while Nile took two wickets in the 3rd ODI. The South African team has landed here in the game after winning the last one against Australians. The Proteas must be on high confidence after the result of third one day. The bowlers made the extra efforts where the batsmen lacked. SA captain AB de Villiers hasn’t been seen scoring big runs yet. It is the unexpected and usual behavior of him as visible from his last innings. Rilee Rossouw won’t play due to a shoulder injury. Dean Elgar will come in place of Rilee. However, if Faf du Plessis becomes fit, he will come in action for his team. Whichever team will get to rank at the top of the points table. 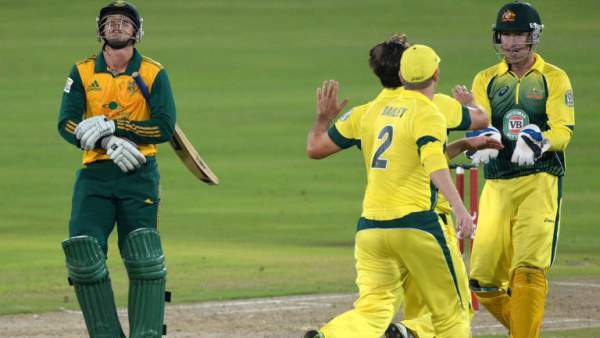 AUS vs SA 4th ODI starts at 6 pm BST or 10:30 pm IST. The UK audience will get to watch it on Sky Sports 5 and Sky Sports 5 HD. Possible XI: David Warner, Aaron Finch, Usman Khawaja, Steve Smith (c), Glenn Maxwell, Mitchell Marsh, Matthew Wade (wk), Mitchell Starc, Adam Zampa, Josh Hazelwood, Nathan Lyon. Possible XI: Quinton de Kock (wk), Hashim Amla, Dean Elgar, AB de Villiers (c), JP Duminy, Farhaan Behardien, Wayne Parnell, Aaron Phangiso, Kagiso Rabada, Imran Tahir, Tabraiz Shamsi. Stay tuned for the match result, ball by ball updates commentary, highlights, full scorecard and much more.